The WillCo-dish®KIT ("KIT") 'Do-It-Yourself" dishes, of which we have four (4) basic types in polystyrene (PS), are growing fast in popularity. You will have perfect glass bottom dishes, at very low cost. These four basic types, we offer both in "transparent -", as well as in "black" walled&lidded dishes. 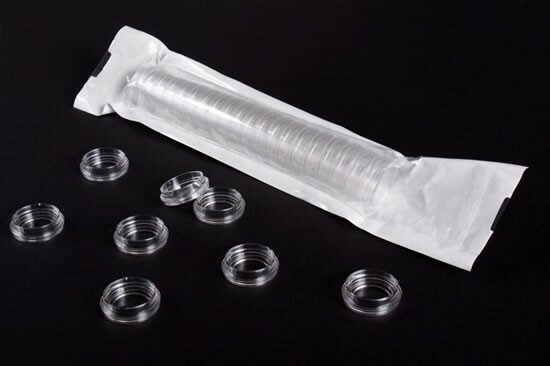 We designed the 'Series WillCo-dish®KIT' dishes, to offer Scientists the opportunity, to use any chosen "material - as well as different thicknesses", for the bottom of a perfect "WillCo-dish® Glass Bottom dish". As a standard, we offer our (German glass) borosilicate coverslips, in thickness: 170 micron +/- 0.005 mm. - specially selected glass and surface flatness: ra 0.005 mm. Next, we offer thicknesses: Class # 1.5 (160 - 190 micron), Class #1.0 (130 - 160 micron) and Class #0.0 (Extended delivery time). 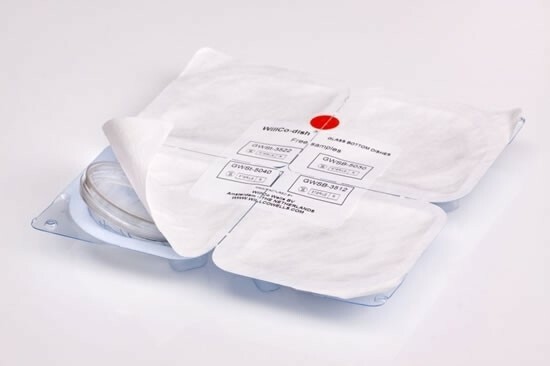 Together with the WillCo-dish®KIT, we developed an ASSEMBLY DEVICE ("DEV") for "EASY, QUICK, ACCURATE/PRECISE & SAFE", as well as LOW COST assembly, of the various types of our WillCo-dish®KIT dishes. : The glass coverslip is NOT bonded to the bottom of the dish, yet! Lids / 500 : Of which all 35 mm dishes, have three little vents inside the lid, for better assimilation. Glass coverslips / 500 : 'German' Glass; Class #1.5 - 170 micron, +/- 5 micron. Adhesive rings / 500 : Double Sided Adhesive ("DSA") rings, by 3M. Tweezer / 1 : Coverslip tweezer (Steel). 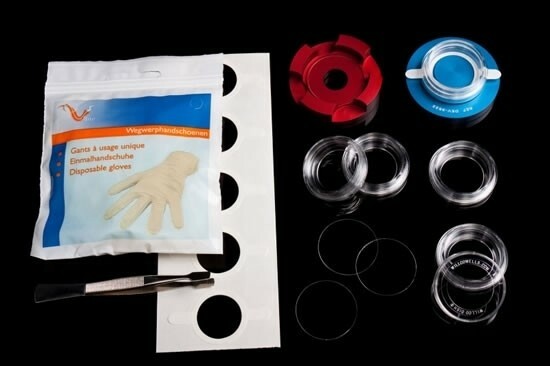 Latex gloves / 2 : To protect your fingers, as well as the glass, from getting fingerprints on it. 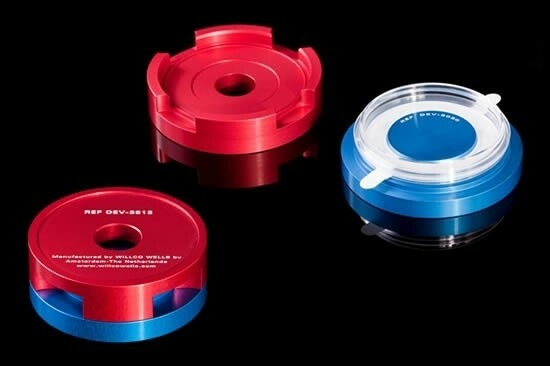 Note: The 2 part aluminum ASSEMBLY DEVICE comes separate; you need to purchase it only ones (per type! ), in a life time. The ASSEMBLY DEVICE you will receive, including a WillCo-dish®KIT "Assembly Instructions" document. You are also welcome to read the document, in this website, next to the KIT-products. Click on 'Assembly Instructions'. Again, using an ASSEMBLY DEVICE with the KIT-dishes makes assembling these fine dishes "Easy, Accurate, Quick and Safe", saving a lot of time and funds. The glass bottom of the WillCo-dish®KIT dishes, is always flush with the warming-stage and flat, a requirement for High Quality Imaging. There is no air buffer, between the glass and the warming stage, creating an even distribution of the temperature, all over the bottom of the dish. This, is very important for your live cells! These features ensure even distribution of the temperature inside the dish, as well as great imaging results. We are convinced, that you will very much appreciate working with our WillCo-dish®KIT "Do-It-Yourself" Glass Bottom dishes. If you have just any questions and/or remaks left, about the KIT-dishes, then please do not hesitate to contact us, immediately. Your WillCo Wells B.V. Customer 'Service-Team'. WillCo-dish® Glass Bottom Dishes, in various types and in transparent, as well as in black. Blister-Pack - WillCo-dish® Glass Bottom dishes - Single Unit packed. Multi Unit Packed, in sleeves of Tyvek® (Dupont) and transparent PA/PE per 20 units. WillCo-dish®KIT - 'Do-It-Yourself' - Glass Bottom dishes. Assembly Devices, for the WillCo-dish®KIT - 'Do-It-Yourself' Glass Bottom Dishes.